While you know that MilitaryByOwner's team are the experts when it comes to buying, selling, or renting a home near military installations across the U.S., you may not be aware of all the other ways we support military families. Along with our series of expert home buying and selling ebooks, over the past couple of years, we've put together numerous ebooks specifically created for military families. From Space-A travel to planning for a stateside or overseas PCS, we've got you covered! Download one or all seven of these ebooks--completely free! One of the biggest perks of military life is the opportunity to explore new locations, whether in the U.S. or at an overseas assignment. 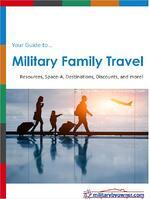 Your Guide to Military Family Travel points you to resources for sightseeing and side trips, along with tips for road trips as well as travel by air or train. Get travel hacks for touring overseas, and learn about military discounts and vacation packages. If you're interested in taking advantage of Space-Available travel (Space-A) via military transport, start here with advice and helpful travel checklists before you start the process. Along with smart tips for handling money during international travel and keeping your home safe while you're away, this ebook has you covered from the beginning of your travels until you arrive safely back home! Are you the lucky recipient of the often coveted overseas orders? While in many ways similar to a CONUS PCS, there are also some crucial differences. 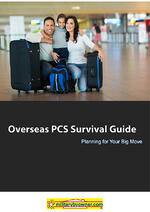 Overseas PCS Survival Guide will walk you through it. With checklists and tips, you'll navigate this overseas move like a pro and will be settled into your new home in no time! 3) PCS Ahead: Should I Sell or Rent My Home? 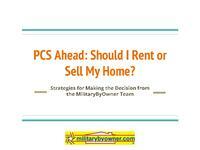 While we included this one in our last ebook round-up, we're also mentioning it here, since a PCS move has a great impact on a military homeowner and brings unique factors into the Should I sell or should I rent? question. PCS Ahead: Should I Sell or Rent My Home? will help you with the decision with tips regarding: when it makes sense to sell or rent (the answer will differ based on many factors), the best time to put your house on the market, resources for military landlords should you choose to rent out your home, financial and tax considerations, and help for selling your home. If you're a homeowner and aren't sure whether to sell or rent your home with an upcoming move, you're not alone. Utilize these pointers from those in the know! 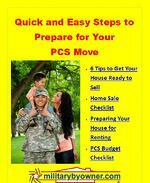 Our very first PCS ebook, Quick and Easy Steps to Prepare for Your PCS Move will guide you through the pre-PCS budgeting phase all the way to prepping your home for sale or rent. Including quick tips for travel, dealing with pet concerns to more detailed checklists for setting your moving budget, you'll want to start here...whether it's your first move or you're a seasoned military mover. After utilizing the tips in this first PCS ebook, download the rest of MilitaryByOwner's PCS ebook series! As you get closer to military transition and another PCS move, the tasks can become overwhelming. Avoid PCS Move Wipeout will help you break it all down into manageable bites. 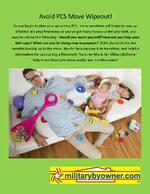 Have you considered doing a Personally Procured Move or DITY ('do it yourself')? We've done it and can give you the steps to take! With checklists for the months preceding a move, you won't miss a beat. Add to that advice for helping military kids cope with a move, and this ebook is chock-full of tips and tricks! You're down to the wire; it's the week of your move. Look no farther! Bloom Where PCS Plants You helps you prepare with checklists and tips for each step of the way. Wondering how to prep your home for the week of the move, the actual moving day, what's expected as you deal with the moving crew, or how to set priorities as you move into your new place? And to top it all off, our seasoned military spouses and families have tips for exploring your new area when you're ready to escape the sea of boxes. Military families know that truth is regularly stranger than fiction. 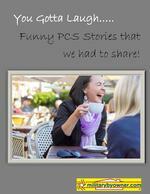 In You Gotta Laugh: Funny PCS Stories We Had to Share, we're sharing a few of our favorites! Let's take a look at the lighter side of military moving. Have you also...moved with an injury? Found someone else's things in your moving boxes? Stayed in a one-room hotel with sick toddlers and giant dogs? Had orders changed last minute? Whether it's been a "creative" packing technique, gifting you with a half-used carton of milk on unloading, or simply learning to laugh instead of cry at the mishaps that come with moving your entire household every few years, grab your favorite beverage and chuckle along with us at some of the favorite stories of our staff. MilitaryByOwner is your go-to resource for all things military move related! Download our entire library of free ebooks.